“Social Media Roundup” is a weekly roundup of news pertaining to all of your favorite websites and applications used for social networking. Published on Sundays, “Social Media Roundup” will help you stay up-to-date on all the important social media news you need to know. Facebook announced that it is shutting down the Moments app on February 25. The Facebook Moments app was created as a way for photos and videos to be automatically uploaded to the social network privately. 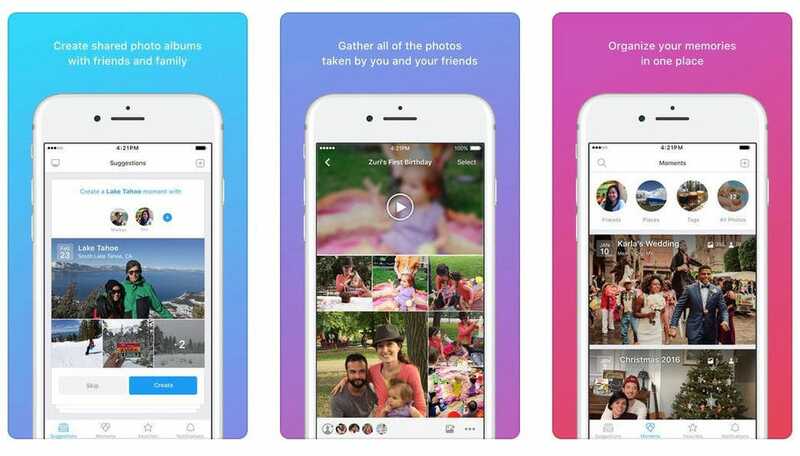 The Moments app automatically organized the photos and videos based on the time, location and people in them. And then you can share the photos and videos with those people privately. Facebook is offering two ways to export photos and videos from the Moments app before February 25. Either you can create private albums on your Facebook profile or you can download the photos and videos to your device. The photos and videos can be exported from the Moments website through May 2019. Users who create private Facebook albums will see a link next to each moment that can be viewed as an album on the social network. And users who download the file will have to enter their Facebook password. After selecting the quality size, users will receive an emailed link to download the files. According to a report by The New York Times, Facebook CEO Mark Zuckerberg is planning to integrate WhatsApp, Instagram and Messenger. The messaging apps will continue to be standalone, but the underlying technical infrastructure will become unified. So this would allow the 2.6 billion users across the three apps to communicate across the platforms. The project is currently in the early stages and is expected to be completed by the end of 2020 or at the beginning of next year. The reason why this project would take a while to put together is that it would require thousands of employees at the company to reconfigure the apps at the most basic levels. And Zuckerberg is also requiring the apps to retain their end-to-end encryption technology. In the past, Facebook planned to keep Instagram and WhatsApp autonomous. But Facebook has been subtly connecting features between the social platforms. For example, a single inbox for Facebook, Instagram and Messenger launched in 2016. To create a WhatsApp account, users just need to sign up with a phone number. But Facebook and Facebook’s Messenger requires real identities. How will Facebook allow users to message each other without linking real identities to WhatsApp? “As you would expect, there is a lot of discussion and debate as we begin the long process of figuring out all the details of how this will work,” said Facebook in a statement via The New York Times. This past week, Forbes contributor Erik Kain published an article about how Facebook reportedly turned a blind eye to kids getting duped into spending real money while playing games and using apps. And in some cases, Facebook often refused to refund hundreds or even thousands of dollars. The Center for Investigative Reporting’s Reveal publication saidthat the “friendly fraud” issue was discovered in court documents unsealed as part of a class-action lawsuit. Since refunds were not issued in a number of cases, parents turned to the Better Business Bureau, credit card companies and courts to get money their back. The documents pointed out that revenue Facebook made from children had large chargeback rates, which is a process where credit card companies are forced to get money back on behalf of its customers. The chargeback rates for Facebook games were at 9%, which is 18 times the average for businesses according to the Merchant Risk Council. And this became a “red flag” for the Federal Trade Commission. Interestingly, Facebook executive Tara Stewart sent a message to her colleagues that the social network should consider launching a project that would reduce chargebacks. This process would have required users to verify the authorized use of credit cards such as asking for the first six digits of the number. As this would have a negative impact on revenue, this feature was not implemented. According to Thurrott, Spotify is going to add a new feature for users to block and mute artists that users do not want to see. By activating the block feature, it would remove that artist from playlists including the ones that were curated by Spotify’s staff. To block an artist, you simply have to go to the “…” menu on an artist page and tap on “Don’t play this artist.” Then you would have to unblock the artists to hear their music again. This feature does not work on tracks that an artist is featured on. Was just talking about this with @kayvz. Will fix. Twitter is currently testing a new tag called “Original Tweeter,” which would show who started a thread. This feature is currently being tested on a “small percentage” of users on iOS and Android, according to TechCrunch. “Twitter’s purpose is to serve the public conversation. As part of this work, we’re exploring adding more context to discussions by highlighting relevant replies – like those from the original Tweeter,” said Twitter director of product management Sara Haider in a statement via TechCrunch. The Original Tweeter feature could also help prevent fake information from spreading as there are a number of accounts who appear to falsely belong to prominent figures such as President Trump and Elon Musk on Twitter. “Original Tweeter, ” huh? I guess that’s how they’ll fix this thing. WhatsApp is reducing the number of times that a user can forward a message to only five times as a way to prevent misinformation from spreading. Reuters reported that this limit is being applied to all users globally. Originally, WhatsApp used to allow messages to be forwarded to 256 people. And then it became limited to 20 individuals or groups in July. Around that same time, WhatsApp also started labeling forwarded messages. WhatsApp has been used maliciously to spread misinformation in India where it led to mob lynchings. The spreading of conspiracy theories and misinformation also happened in Brazil during the presidential election this past October. After the forward limit was reduced to 20 in India, the number of forwarded messages shared on the platform was down 25% said a WhatsApp spokesperson via AdWeek. However, The Verge pointed outthat the messages can still be forwarded to groups of 256 people each though. So a forwarded message could still be seen by 1,300 people even with the five message limit.